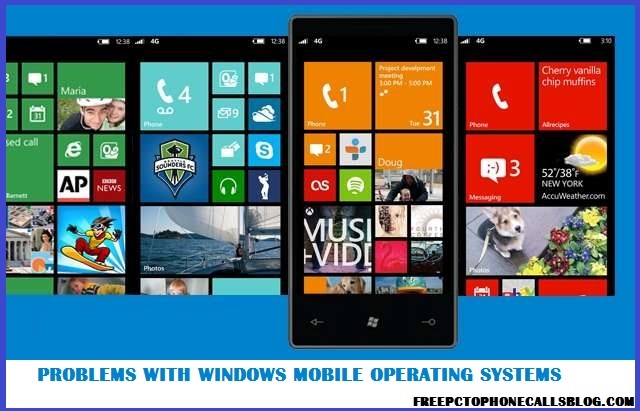 Problems with Windows Mobile : Why not to choose this Operating System | Free Pc to Phone Calls, Free Voip Calls to India International ! If you are having problems with your current operating system (in your mobile) and planning to make a switch to a more enhanced operating system (and so called cool OS), then need not to worry. We already have so many different mobile operating systems in the market. We have Apple iOS is well known for its stability, Android quite popular for its creativity, Blackberry phones (aka business phones), Windows Based Mobiles, Symbian OS, Samsung Bada OS or other custom operating systems. Selecting and zeroing on a particular operating system (for that matter a mobile phone) is a very difficult choice. Each of the above has its own pros and cons, but then we do have to make a choice. The web is full of information praising the different operating systems, but very less people present the information in opposite way. Its better to look what problems will you face if you go ahead and buy a particular mobile. Will these issue's affect you in any way (if the answer is No, then go ahead and buy that phone). If you are planning to buy a windows based mobile (viz.. Nokia Lumia 510, 610, 710, 810, 900) or any other, then you should read the post below. We will discuss some of the problems that you have face with windows os (7.8 or 8.0) if you buy them (or the issue's which people are already facing). Windows Phones have very less Apps available : Its the most obvious and well known problem that windows based mobiles are facing. Windows Phone needs more apps in every genre, be it games, utility, entertainment. Though most of the basic apps like Facebook, Search, Browser, Music, Few games are available, but it way way less than what android or iOS offers. Microsoft needs to involve more and more developers and give them incentive so that they develop new apps. No Custom UI, Only Tile Tile Tile : No doubt the tile theme looks good on your mobile screen, but that does not mean I have to stick with it. Some apps like Pictures make good use of this tile thing, but for most of the apps, it is just icons placed at the top screen. Android User Interface (in terms of looks) is way better. But I guess it is only the simple tile thing which makes it so easy to use. Why is not Skype tightly integrated with Microsoft Windows OS : I mean Skype is just another application on windows mobile. When Skype is owned by Microsoft and its there own operating system, why can't they work on it and provide a good and better video calling experience. If its Facetime for Apple, why can't Skype be for Windows (I am not saying that Skype should be stopped for other OS). Google Sync Issues with Windows Mobile : Check this support page for details. It turns out that there are many things like syncing Google Calender which have problems with windows mobile phones. Though it is being worked upon, but still its in beta phase. Windows Phones also Hangs : Yup depending upon the phone hardware you are using, it sometimes becomes unresponsive (or crashes or hangs). Some of the common solution is to restart your phone, or restore to factory settings etc. Check this page for details on this. Camera Issues with Windows 8 : Some of the issues are present in Nokia Lumia 900 (check internet for details), which is promised to be corrected in next version of OS. Common Issues in Windows Mobile Operating System : Following are the common problems. - Please bring more billing options to buy apps from market place. Make it easy to buy apps. - Do Not Disturb Feature in rooms seems not upto mark. Every-time someone sends a new message to the room, the phone starts beeping. - Please improve the podcast support. - I need Customized “alert tones” for different notifications. There is a default alert tone for every notification. How do I distinguish if its a message from Whatsapp or Viber or a general message. - Bing, Bing, Bing : This bing search keeps annoying you. - Battery Information on the home screen : Smartphone are energy hungry phones and you do not have any information about battery left (on your home screen). If you are having a windows based mobile, then please share your views with us. Another missing feature which I like on android mobile/iPhone is siri or android voice directions. Internet explorer on windows mobile does not even has a forward button and the back button take you home. I mean we require forward button guys, every browser has it. Its really annoying not having such basic feature.